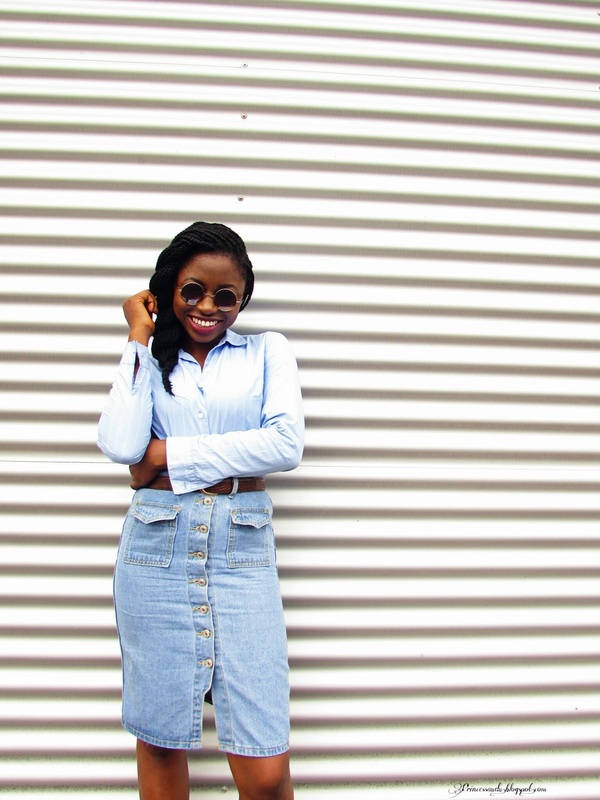 Princess Audu 11:55:00 am Brand collaboration, collaboration, denim skirt, Fashion, shades of blue. Hey beautiful people, how are we all doing? Wow July has flown by way too fast. 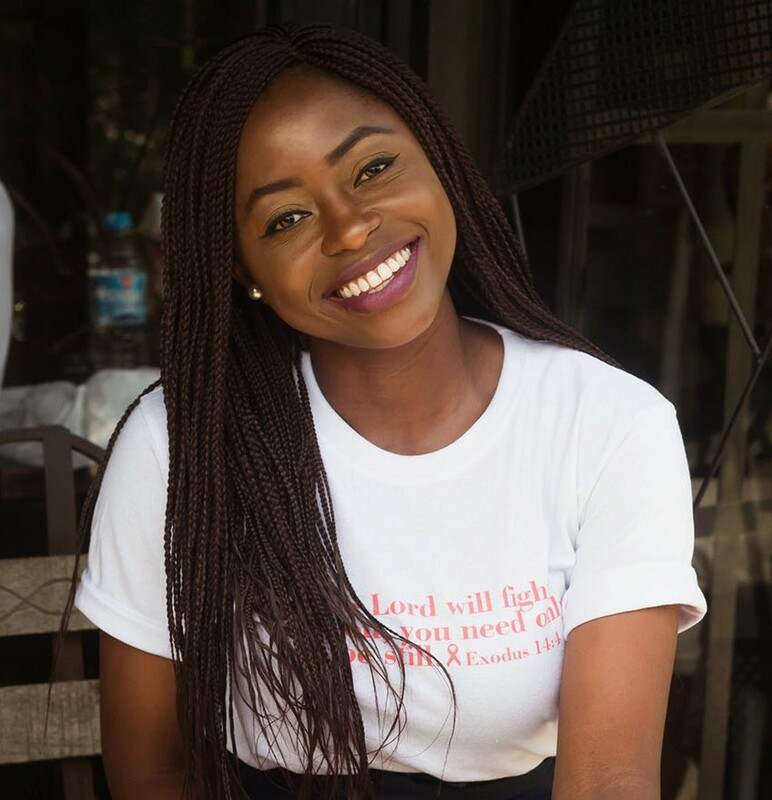 I'll soon be rounding up with my NYSC program blogged about here. Not a hundred percent sure what's next but I'll go where the money and opportunity takes me. By the way guys your girl is looking for a job in any related media field, radio, TV, or print. Hook a sister up! So the other day I had to reassemble my portable wardrobe. After searching for the manual, I decided to forgo it as I felt it was wasting my time but the truth is I didn't search hard enough. Now after struggling for several hours I ended up with a funny looking wardrobe completely different from the one in the picture. Feeling disappointed and dissatisfied I decided to properly search for the manual. Now when I used the manual, I easily worked my way to a perfect wardrobe just like the one in the picture. Now why am I talking about how I assembled a wardrobe? Well this got me thinking about life. God gives us the manual to life through his word but we tend to neglect it thinking that we can handle things on our own. But then we end up stuck in situations that make us unhappy and we blame God for it. "People ruin their lives by their own foolishness and then are angry at the Lord" (Proverbs 19:3 NLT). If we only make him our first option, rely on him, and listen to him then we would save ourselves so much heartache. 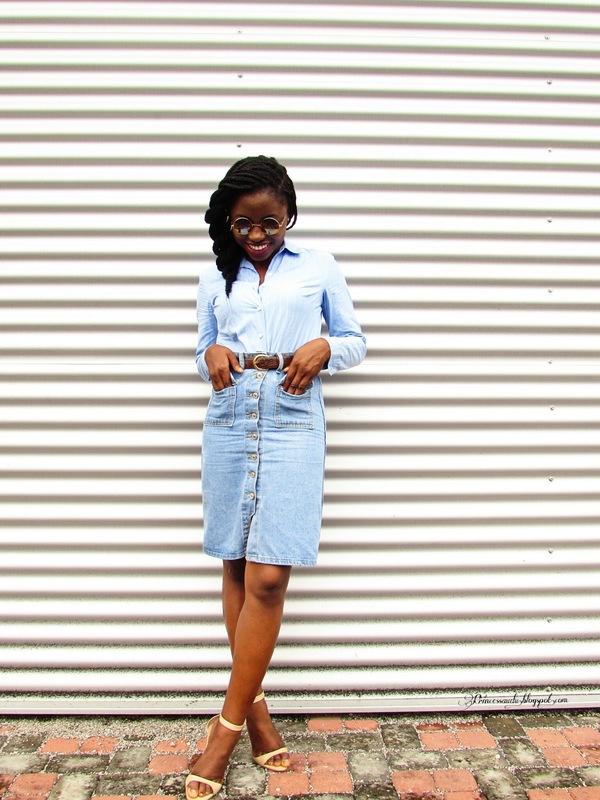 Now onto the outfit, I've always loved denim skirts because they are perfect for those days when NEPA is unfaithful. I received this pair from Shein, the item came in less than three weeks. Although I do wish the skirt was longer, I absolutely love the buttons and pockets which add a nice vintage vibe which is exactly how I like my outfits. 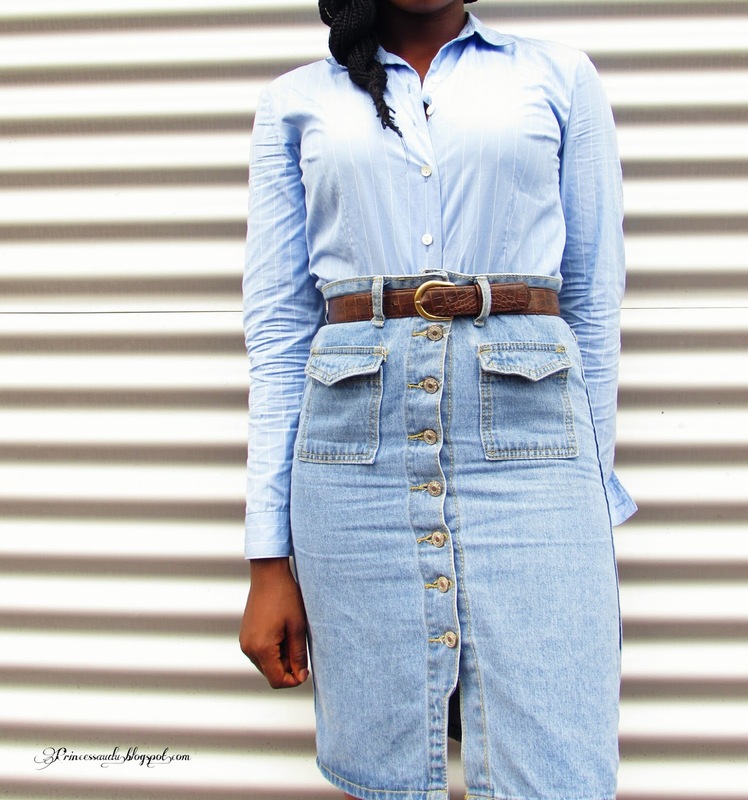 I decided to pair the denim skirt with my pinstripe shirt and then a belt to cinch in my waist. As for the sizing I recommend going a size up as this is an Asian site but the quality is amazing for the price of $12.99 . I look forward to purchasing more items on Shein, well that is when the naira dollar rate calms down. Where would you rock this look to and how would you style this differently? 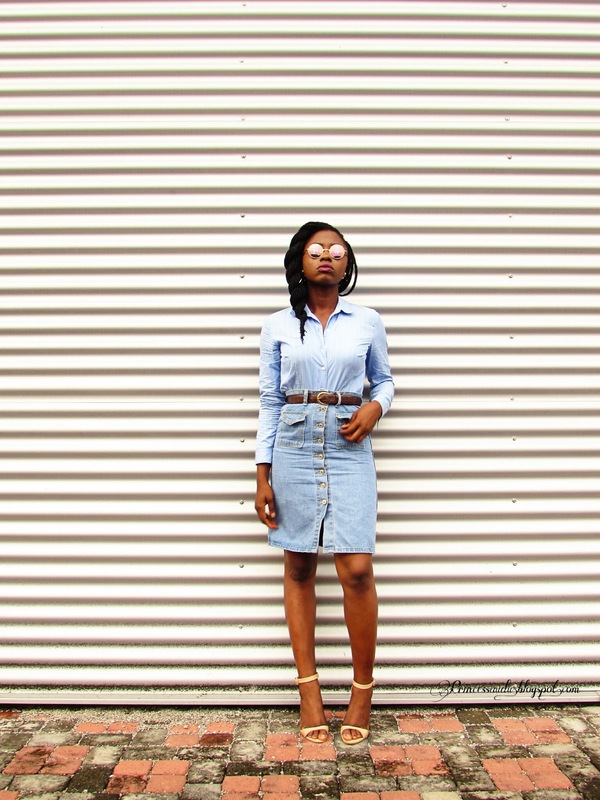 Labels: Brand collaboration, collaboration, denim skirt, Fashion, shades of blue. Love the skirt and that background makes the outfit pop. As in when the dollar comes down oh. Love the outfit , the skirt is super cute. You look great. I love the fact you always inspire with your posts. Amazing. This skirt is really cool and you made fantastic combo with it! You look gorgeous! Get it girl! I love the whole look, and the message in your post too. Think of how much easier life would be if we read the creator's manual! You rock the skirt girl. All the best in looking for a job. God will direct you Hun. Tell me about July this year is generally flying by on a jetspeed. That's a lovely skirt! And fab styling of it. I get you on the exchange rates...killing. First of all, cool shades! And I'm just so in love with jeans skirts- on others. you totally slayed this look. That bible verse spoke to me. Thanks for sharing. Definitely something I have been thinking and praying about lately. May God help us to obey him and follow His direction. 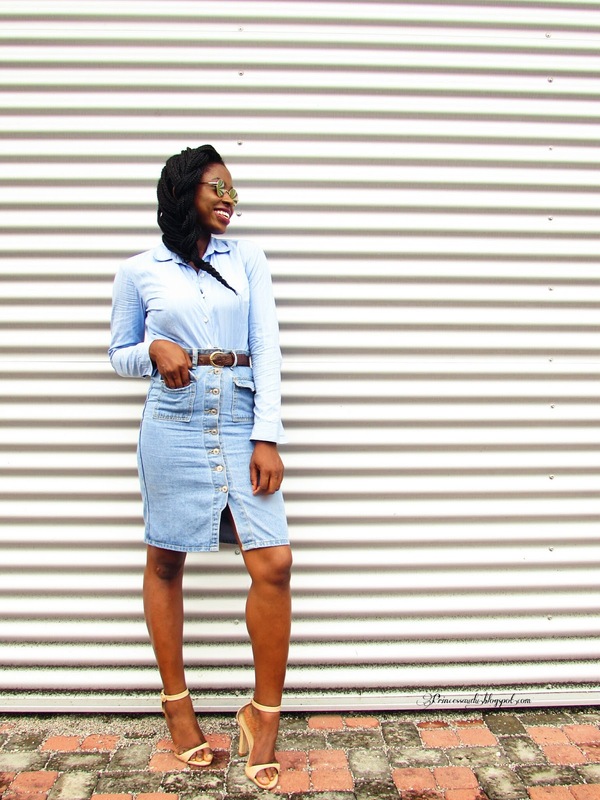 Love the denim on denim.. Shein is a great online store I'm testify too. Awesome choice of location. Makes the outfit pop. The pix is dope! Thé background is niiiiceeee! You're so good at taking your own pics, I miss my tripod right now I can't even have good enough (to my taste) pics. Anyways, that outfit is lovely! I have been looking for a skirt like that but didn't think of Sheinside. I initially thought it was a denim shirt. 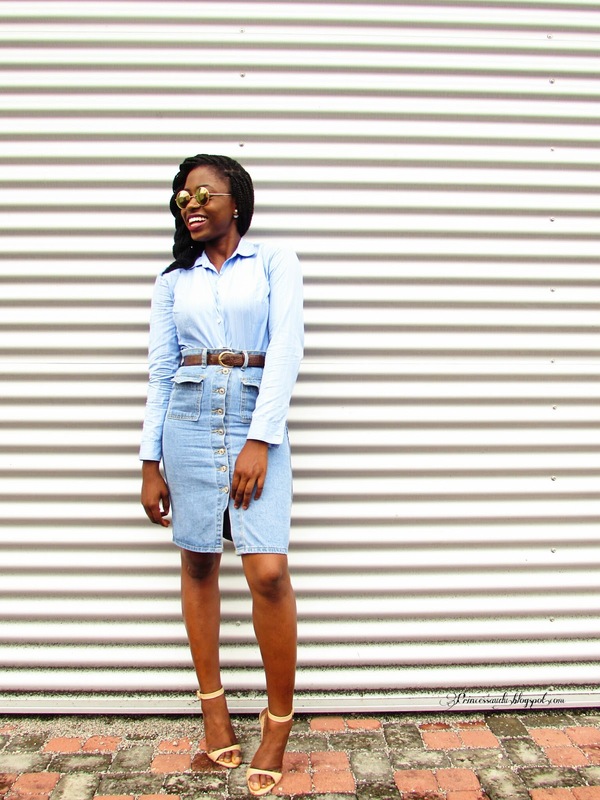 Love this look and denim skirts are so nice, it's difficult to not style them well.